Mexican artist Frida Kahlo, full name: Magdalena Carmen Frida Kahlo y Calderón, was born in 1907 in Mexico City. Her father was a photographer of Hungarian Jewish descent, who had been born in Germany; her mother was Spanish and Native American. Health problems plagued her most of her life. Nevertheless, she led a very active life, both artistically and politically. She was often included in the Surrealist movement; not by herself, however. In July 1954, Frida Kahlo made her last public appearance, when she participated in a communist demonstration against the overthrow of the left-wing Guatemalan president Jacobo Arbenz. Soon afterwards, on 13 July, she died, in the ‘Blue House‘ where she was born. It is a museum today. 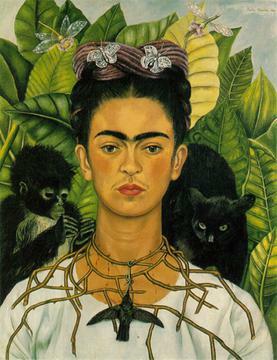 This entry was posted in Politics, Visual arts and tagged Frida Kahlo, Mexico, painting by petrel41. Bookmark the permalink. The photographs of Las Soldaderas and Elena Poniatowska’s remarkable commentary rescue the women of the Mexican Revolution from the dust and oblivion of history. These are the Adelitas and Valentinas celebrated in famous corridos mexicano/as, but whose destiny was much more profound and tragic than the idealistic words of ballads. These women are valiant, furious, loyal, maternal, and hard-working; they wear a mask that is part immaculate virgin, part mother and wife, and part fiery warrior; and they are joined together in the cruel hymn of blood and death from which they built their own history of the Revolution. I love Frida Kahlo. What an amazing woman. The world needs more like her.